Associated Wrestling Press will be presenting a list of returning All-Americans with their accomplishments for the 2016-2017 season in the Women’s College Wrestling Association every week. The first weight we will be featuring is the 101-pound weight class. An interesting note is that four out of the five Grapplers on the list have roots in the state of California. Here’s a look at the returning All-Americans in the 101-pound weight class. *A native of San Jose, California, Walker attended Pioneer High School where she was a two-time state qualifier and placed eight in the 2015 CIF state tournament prior to attending McKendree University. During the 2015-2016 college season, Walker posted an overall record of 21-13 and was tied for third on the team with six falls and nine tech falls. She was a WCWA All-American with an eighth place finish at 101 pounds and finished the season ranked No. 10. During the regular season, she won the Bearcat Open championship and finished in seventh place at the Missouri Valley Open. *Hiba Salem attended South San Francisco High where she was a three-time CIF California state qualifier and placed twice in the tournament (7th and 7th). Salem also gathered All-American honors at USAW Freestyle Nationals during her prep career. On her first season with the Oaks, Salem finished with a 6-2 record at the 2015 Cliff Keen Women’s Duals, fifth at the Missouri Valley Open, second at the Menlo College Women`s Open and finished with a 16-8 record. *A native of Kingsburg, California, Regina attended Kingsburg High where she and her twin sister (Marina), not only dominated the Golden State, but the international stage as well. Regina has won two silver medals at the Pan American Games and was the 2013 Cadet World silver medalist. This past season, Marina became an All-American for the second straight year and helped King University win their third straight WCWA national championship. During the regular season, Regina finished runner-up at the Missouri Valley Open to teammate Ashley Iliff, took third at the Emmanuel Open and the Tornado Open, and went 14-5 on the season with six technical falls and three falls. *Ohio native, Sarah Allen, competed for Wayne High where she was a two-year varsity starter on the boys wrestling team at 106 and 113 pounds. Sarah is a three-time WCWA All-American as she has placed (7th, 5th, and 2nd). Allen had a great junior season as she placed fourth at the Missouri Valley Open, second at the Tornado Invitational and was champion at the NAIA Invitational. *Just like her twin sister (Regina), Marina was also too much for her opponents on the high school level. 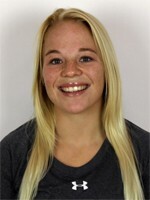 She continued her wrestling success in college as she was a WCWA national finalist as a freshman losing to four-time national champion, Emily Webster of Oklahoma City. This season, Regina went 30-1, including 12 technical falls and 6 falls, only loss of the season was to teammate Ashley Iliff, 1-1 on criteria at the Missouri Valley Open. Marina won her first 16 matches of the season and closed the season on a 14-match winning streak. Marina won individual titles at the Emmanuel Open and the Tornado Open and finished third at the Missouri Valley Open.